Cookie's Kids » All » Can Comic Books Convert a Reluctant Reader? Can Comic Books Convert a Reluctant Reader? Many parents struggle when it comes to encouraging their kids to love reading. Making a child read a book assigned by an English teacher is one thing, but how do you make a child actively seek out books to read? Sometimes it can take a little extra inspiration from an unexpected source: comic books. Comic books are a great way to bridge the gap between assigned reading and reading for pleasure. The great thing about comics is that they appeal to boys and girls as young as 5 or 6 through late teens, span a wide range of genres, and are less intimidating than a “chapter book.” They may not seem like serious reading, but they can open your child’s mind about books in important ways. They also get your child into the habit of sitting quietly and interacting with words on a page. Chances are your child is already familiar with some comic book characters, whether from classic comics-to-movie crossovers (Iron Man, Spider-Man), cartoon-to-comic crossovers (Hello Kitty, The Simpsons), or newspaper funny pages (Garfield, Calvin and Hobbes). When a child loves a character, present them with the opportunity to spend some extra time with that character in the comic book format. You’ll often find their reluctance toward reading will melt away. Although comics contain fewer words than books, they can still help a child expand their vocabulary. Because so much of the story is told through pictures, kids don’t need to understand or be able to read all the words to be able to follow the story. They can use the pictures to help make sense of the words. 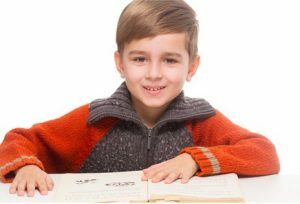 Once a child starts developing a taste for comic books, you can steer them towards graphic novels, which are longer, have more writing, and tend to be more serious. Graphic novels will introduce them to even more complex stories and advanced vocabulary. Next time you accompany your child to the bookstore to pick up some comics, encourage them to try a chapter book, too. Read the first few chapters together, then, when they are hooked on the story, let them read some more of it on their own. If the first book doesn’t take, simply try again. When they find a story that truly resonates, they will gladly read it on their own – the first step toward a lifelong habit of reading.